Through the year we typically take part in five or six weekend events. Most will be late medieval events, portraying life in the ‘wars of the roses’ the series of battles in Britain in the late 15th Century. Generally these will involve camping, Living History demonstrations, Battle re-enactment, and then convivial drinking round a campfire in the evening. Whilst Dysmas used to be mostly a battle reenactment group, we’ve become older and more family orientated over the years, so we concentrate mostly on ‘Living History’ demonstrating medieval crafts and food, and talking to the public about medieval life. 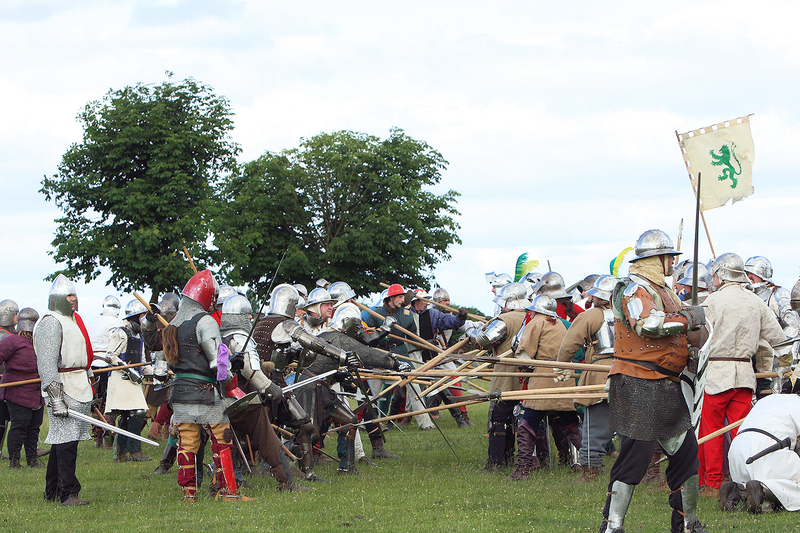 Some of us still take part in the battle events, but typically joining in with other groups we know, but mostly we are involved in the less violent side of reenactment these days! 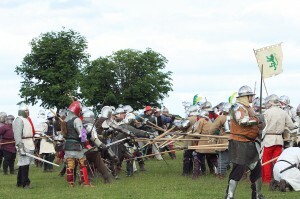 A typical reenactment battle.A later historical event.